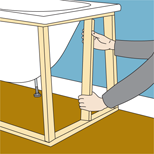 Summary: Learn how to fit bath front panels, fit battens and fit the bath front panel. Bath panels are required to hide the pipes that lead from the taps to the water supply/drainage. The panels fit to the sides of the tub that are not up against the wall. Due to the fact that there is such a wide variety of bath shapes and sizes, it is never as easy as simply slotting a bath panel onto the tub. The task is not a particularly hard one, however. Taking the time to build a basic, sturdy frame around the sides of the tub onto which the panel can be attached will leave you with a strong, attractive looking bath. You need to start by making the frame around the sides of the bath tub. 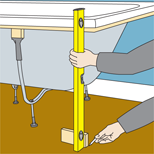 Using a spirit level, mark the position of where the panel will be on the floor. This will be the marker so you know where to fit the timber battens which form the frame, i.e. the battens will be positioned the panels thickness away from the line you have drawn. Cut strips of batten and fix them lengthways along the floor to form the base of the frame. 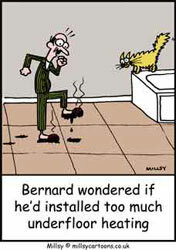 To fix them to the floor, screw pilot holes into the floor and screw securely in place. Then fix the vertical battens into place between the base of the frame and the underside of the bath rim. There should be one on each corner and another in between two corner battens. Make sure they are level. With the frame formed, you need to cut the panel so it will fit. Do this using a hacksaw or if possible, a jigsaw. For tight angles where the hacksaw handle is in the way, remove the handle and use the blade on its own. Once the panel is complete, screw pilot holes in the panel and the battens, then screw them securely together.